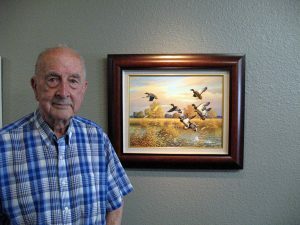 Throughout his lengthy career, Adamson has observed, studied and painted the colorful participants in the massive annual waterfowl migration. Although best known for his landscapes awash with flocks of mallards and pintails, on occasion Adamson has painted bighorn sheep, condors and falcons, and the unusual and colorful tropical birds encountered during his many trips abroad. Part of the appeal of Adamson’s paintings is that, “He paints to the hunter’s dream.” Although Adamson has never been a hunter himself, many of his paintings, done from the position of a duck blind, evoke memories in the outdoors enthusiast, whether they be of an early-morning close-up view of a flock of mallards or of a stunning landscape experienced. 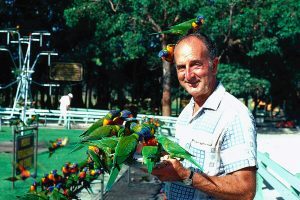 A lover of nature and the outdoors, Adamson has, over his lifetime, donated paintings and prints worth close to three million dollars to raise money for conservation causes. Adamson was a founding member of the Mt. Diablo Audubon Society. Adamson’s work has frequently been displayed nationally and internationally in the prestigious “Birds in Art” and “Animals in Art” exhibitions, and has been shown at the Smithsonian Art Museum, the British Museum and the Carnegie Museum of Natural History in Pittsburgh, among others. 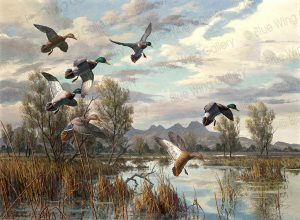 He was named the first California Waterfowl Association Artist of the Year and 1979 Ducks Unlimited Artist of the Year.